Duck Hunting in Azerbaijan State Musical Theatre buy tickets online. Delivery of tickets for the event Duck Hunting. 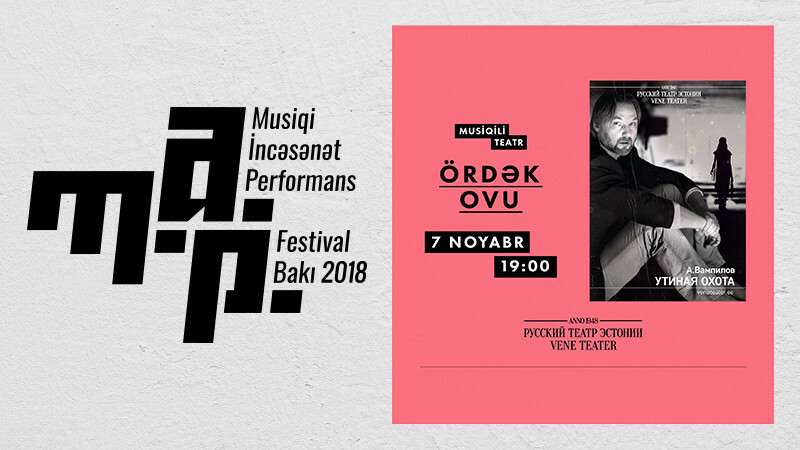 This year Vene Teater is celebrating their 70th anniversary. Throughout these years the theatre has changed generations of directors and actors. Andrei Tarkovsky and Roman Viktyuk have once directed plays here. At the moment the theatre is showing the productions of Viktor Ryzhakov and Sasha Pepelyayev. Apart from the classical repertoire, from the end of the 90s, the theatre stage began to show the plays of contemporary Estonian playwrights. Since 2017 the new artistic director of the theatre became a director from Moscow, Filipp Los. Kamran Shahmardan, who has lived in Finland for twenty years, received recognition as a theatre director and head of his own theatre, Black and White. He regularly stages performances in his homecountry Azerbaijan and in Russia, and from recently also in Estonia. His new work in Vene Teater was the production of "Duck Hunting" based on the play of Alexander Vampilov (1937—1972). At the center of the play is a complex and heterogeneous character, Viktor Zilov (actor Alexander Ivashkevich), who had fallen out of time and its rhythm, for which action and inaction are equally pernicious. According to the director, "Duck Hunting" is one of the most difficult plays of Russian dramaturgy of the 20th century, which combines the echoes of the Chekhov theatre, and the piercing sounds of modern times. Shakhmardan's performance is a compound between the past and the present: the hero restores lost fragments in his memory, but his whole life is running on the spot— constant expectation of the unknown, and he himself turns tragedy into a farce. All the action occurs at a restaurant, where Zilov's drama is played out in the eternal feast.